Apple, cinnamon & caramel come together for the perfect fall treat. This moist apple cake with caramel frosting is filled with warm, comforting flavors and makes for the perfect dessert. Today we’re embracing fall and making the perfect apple cake recipe. I’m not quite ready for pumpkin recipes yet – I’m definitely ready for some caramel apple goodness. And that’s exactly what we’re making. This apple cake with caramel frosting combines 3 of my favorite fall flavors – fresh apples, warm cinnamon, and a little salted caramel. 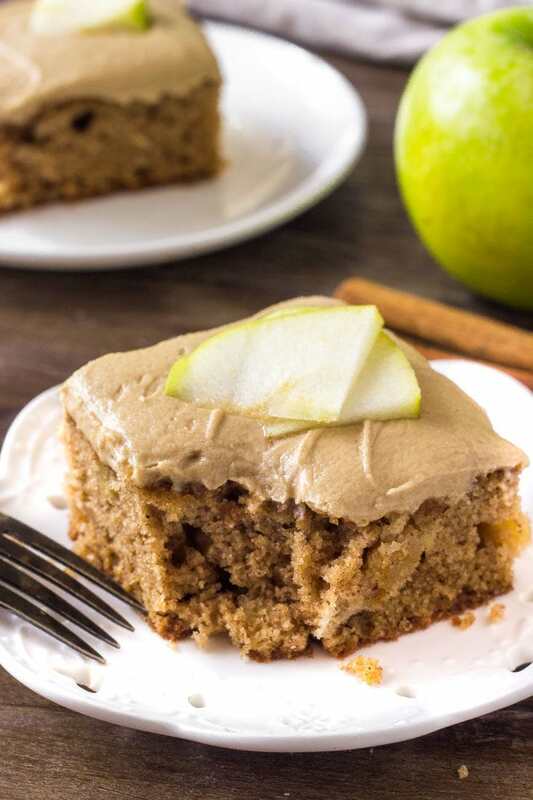 The apple cake is moist, flavorful, and filled with little bites of apple. Then it’s topped with a sweet caramel frosting that takes this fall treat to the next level. What you’ll love about this apple cake is that it’s oh so moist and packed with flavor. 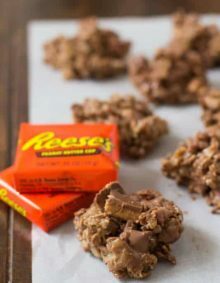 It’s a little denser in texture to support the chunks of apple, and the crumb is tender and soft. The amazing texture is because we’re using oil to keep the crumb soft, eggs for tenderness, and a little sour cream for moisture. Then the cake is filled with sooooo much flavor thanks to the brown sugar, vanilla extract, cinnamon and apples. What Kind of Apples for Apple Cake? For this apple cake – I definitely recommend using a tart baking apple, such as Granny Smith. The apple will sweeten as it bakes and the flavor will mellow. For this recipe it’s really important to cut the apple into very small pieces, otherwise, the cake can kind of fall apart when you go to cut into it. In a saucepan over low-medium heat, melt the butter. Add in the brown sugar and cream. Melt everything together while whisking gently. After it’s melted, bring to a gentle boil for 3 minutes while whisking. Remove the pan from the heat, and pour the mixture into a large bowl. Cool for at least 15 minutes. Add in the vanilla extract & salt. Then beat in the powdered sugar 1 cup at a time, alternating with 1 tablespoon of heavy cream until the desired consistency & sweetness is reached. I love the salty sweetness of the caramel frosting – but it’s definitely sweet. So you won’t need a really thick layer on the cake. But if frosting isn’t really your thing at all, this cake is super delicious on its own or with a scoop of ice cream. 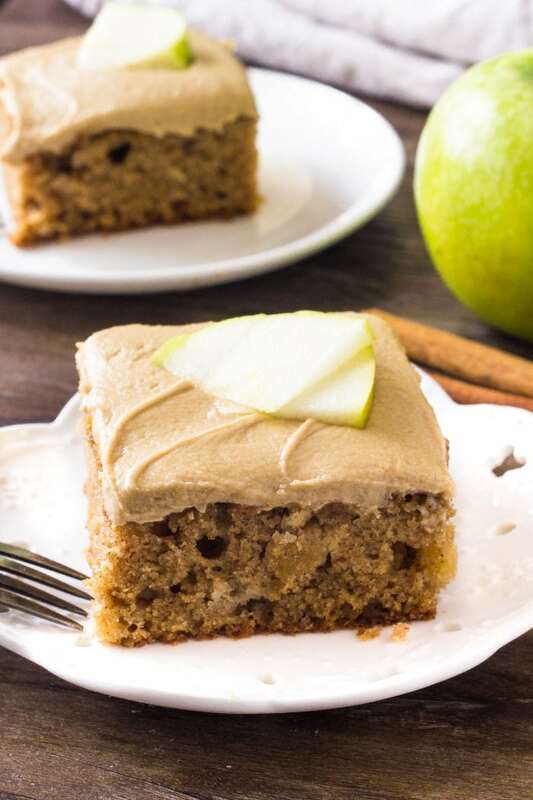 This apple cake with caramel frosting is such a delicious fall treat. The combo of apples, cinnamon & delicious caramel combines 3 of my favorite flavors into one delicious cake. 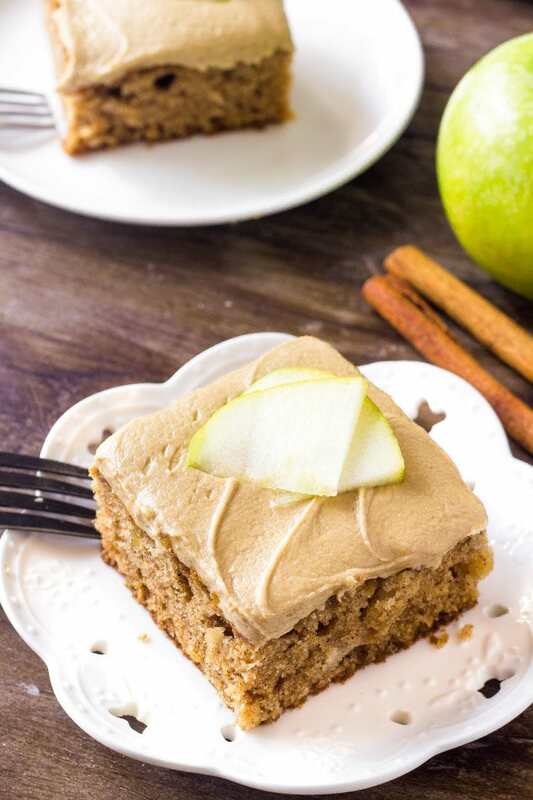 And if you’re looking for an apple treat for fall – then this apple cake with caramel frosting is definitely your recipe! Preheat the oven to 350F degrees. Grease and flour a 9x13 inch cake pan. 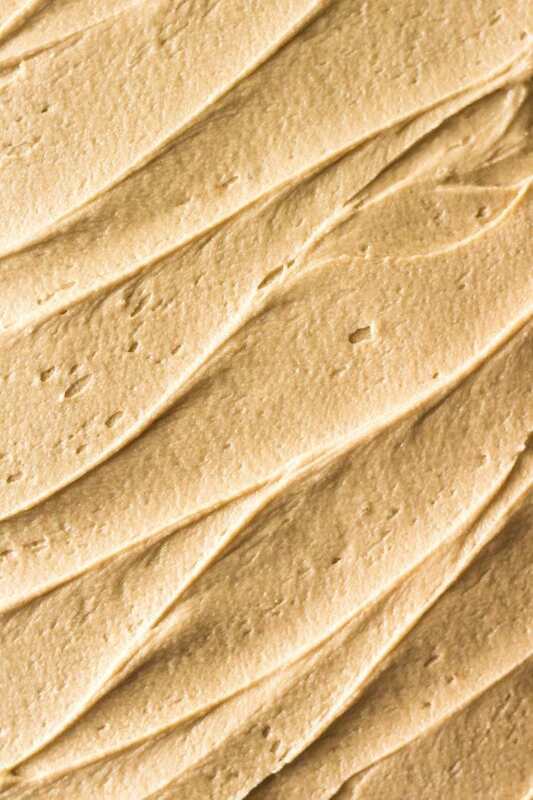 In a medium bowl whisk together the flour, cinnamon, nutmeg, baking soda & salt. 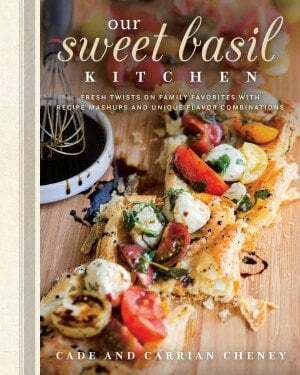 In a large bowl beat together the oil, sugars, eggs & vanilla extract until no lumps remain. Then beat in the sour cream. With the mixer on low speed, beat the flour mixture into the wet ingredients about 1/2 at a time. 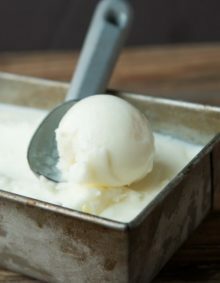 Turn down the mixer and scrape down the sides of the bowl as necessary. Carefully fold in the chopped apple using a rubber spatula or wooden spoon. Pour the batter into the prepared pan and bake for 28-34 minutes, or until an inserted toothpick comes out clean. In a medium saucepan over low-medium heat, melt the butter. Add in the brown sugar and 1/4 cup (4 tablespoons) cream. Melt everything together while whisking. Bring the mixture to a gentle boil for 3 minutes while whisking constantly. Remove from the heat and pour the mixture into a heatproof bowl. Add in the vanilla extract & salt. 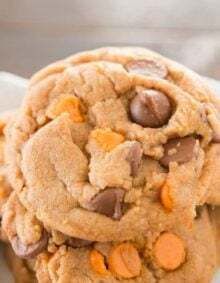 Then beat in the powdered sugar 1 cup at a time, alternating with 1 tablespoon of heavy cream until the desired sweetness & consistency is reached. 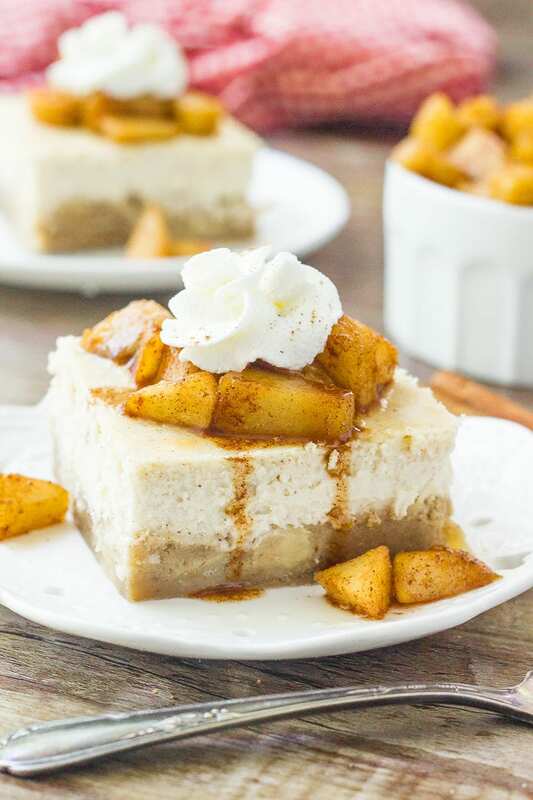 If you love cinnamon & apples – then try these apple cheesecake bars. They have a delicious apple blondie base, creamy cheesecake, and apple pie topping. 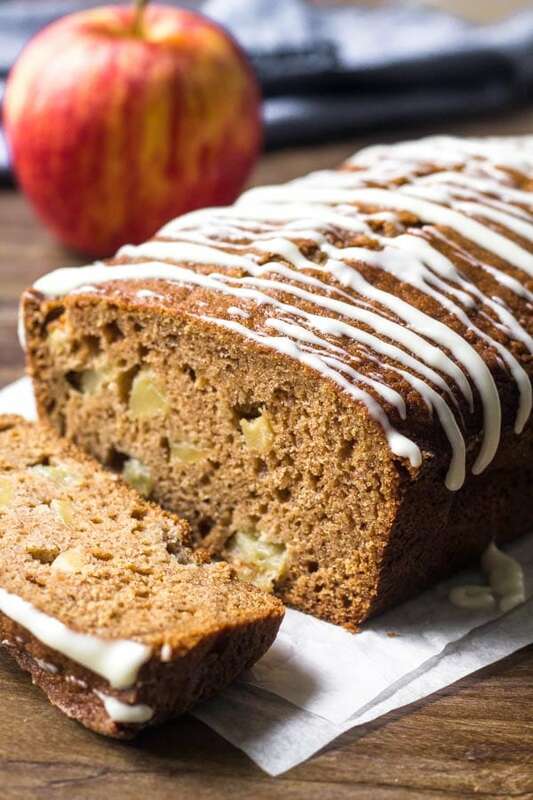 This moist apple bread is filled with brown sugar, spices & tons of apple pieces. Then it’s topped with cream cheese glaze for the perfect apple treat. Well I’m very glad that you fixed it….. was a delicious recipe! Yay!! So sorry about that! I’m glad you enjoyed it! Ok, it is fixed now! Sorry about that! Ugh! I don’t know what is going on with this recipe card! Let me work on it again! Thank you for your patience! I’d like to make this cake… the recipe does not list the ingredients and their amounts?????? Noooo…how did that even happen? I’m on it! Thanks for the heads up! It should be up within the hour. Hi Salina! It is fine on the counter for 2-3 days or up to a week in the refrigerator. the cake directions say to add salt, but there is no salt mentioned in the list of cake ingredients. how much salt goes into the cake? Hi Nancy! Sorry about the confusion. You’ll want to use 1/2 tsp of salt. I will get that updated. 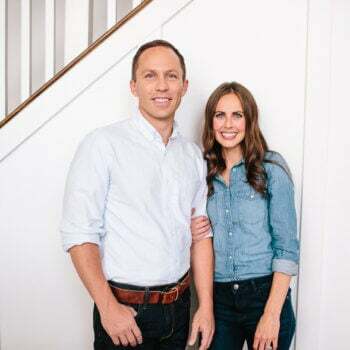 Thank you for bringing it to our attention! It is seriously so dreamy!! This cake looks amazing! I have 1 question do you use kosher salt or table salt in the frosting? Thanks for the awesome recipe.